Acteur et Chanteur Country US né le 21 Juillet 1895 à Vevay (Indiana). Ken Maynard fut le premier singing cowboy. Il est décédé le 23 Mars 1973 à Woodland Hills (Californie). America's first singing cowboy, Ken Maynard starred in over 300 films and though his recorded legacy is far less overwhelming, he did appear on several sides for Columbia. Born in tiny Vevay, Indiana (he later claimed a Texas birthplace), Maynard was a rodeo champion and trick rider for both Buffalo Bill and the Ringling Brothers Wild West shows. He came to Hollywood in 1923 and became popular quite soon, appearing in more than 20 films by the end of the decade. By 1929, Maynard became the first cowboy crooner (on 1929's The Wagon Master), and he entered Columbia studios in Los Angeles one year later to record eight sides, including several from his recent films. 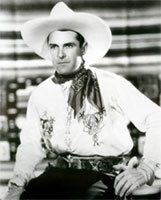 Though he never entered a recording studio again, Maynard remained popular in the film world, winning the top moneymaker award for Westerns in 1936 and 1937 (the first two years the poll was taken). He taught John Wayne the art of stunts, and also provided for Gene Autry's film debut with 1934's In Old Santa Fe. By the end of the '30s however, Maynard's popularity decreased. He made a few more films during the mid-'40s, then retired from active moviemaking. Legendary folklorist Harry Smith later included one of Maynard's recordings, "The Lone Star Trail," on his 1952 folksong compendium Anthology of American Folk Music.